Out of the political unrest of Tughlugh Timur, there arose a Turku-Mongolian Muslim native of Transoxania who did claim descent from Genghis Khan. His idol was Genghis Khan and in military adventures he viciously attacked Persia, India and died in route to China. He also proved his value to the throne by marrying into the family of Genghis Khan. This Mongol warrior took on the name of Timūr Gurkānī, which in Persian means the son-in-law of Timur. Yet the birth name was Tīmūr bin Taraqhay Barlas, or the son of Taraqhay who was the chief of the tribe of Barlas, a Turkic speaking tribe in Mongolia that traced their family lineage to Qarachar Barlas. Today he is known as Temur, Taimur, Timur Lenk, Timur-i Leng, Temur-e Lang, Amir Timur, Aqsaq Timur and in the Latin languages as Tamerlane or Tamburlaine probably in reference to his name of Tamer “the Lame” when he was wounded in a sheep-stealing escapade that left his leg lame. By 1399, Timur had pushed against the gates of the Ottoman Empire, ruled by Bayezid, the Sultan of the Ottoman Empire and the Mamluk Sultan of Egypt. This conflict began in part because the Ottoman Sultan was beginning to annex the territory of the Anatolian Turkmen and Muslim rulers. The Sultan’s forces were also on the verge of conquering Constantinople, seeking to overthrow the capital of the Christian Byzantine Empire. Timur has already proclaimed his suzerainty over the Anatolian territories and so he invaded into the heartland of the Middle East. With the aid of war elephants that he had obtained in India, Tamerlane conquered Aleppo (1400). As Tamerlane headed to Damascus, he sent a message ahead to invoke the fear of the Damascus Islamic population. since no one knows the remedy for your iniquity except me. The Mamluk Sultan in Cairo sent a delegation to negotiate with Tamerlane. As they left, the city was invaded. The Mamluk army was conquered, the Umayyad Mosque was destroyed by fire and the Muslims in the city of Damascus were totally massacred. Their heads were piled in a field outside the north-eastern sector of the city walls that today is a city square called, burj al-ruus, or the “tower of heads.” The only residents spared were the artisans that were deported as captives to his capital at Samarkand. There the palaces, mosques and monuments were erected as an artistic legacy of Timur the Great. It was in 1377 that a revolt erupted in Syria that spread from Damascus to Egypt. By 1382, the city of Cairo was taken over by the Circassian leader Barakah also known as Berkuk (Az-Zahir Sayf ad-Din Barquq (1389-1402). He was proclaimed the Sultan of Egypt and the new Circassian Burgi Mamluk Empire rose to take the place of the deposed Bahri Sultan Dynasty of Egypt. Berkuk was later expelled from Cairo in 1389 CE but returned to recapture the city in 1390 just as the warning signs came from the north that the “Scourge of God” was returning to the Middle East. As the Egyptians watched Aleppo and Damascus destroyed, the new sultan enraged at the treatment of the people of Damascus, raised up a massive army prepared to fight Timer the Lame. When Tamerlane heard of the army of the Sultan of Egypt, it was reported that he “fled” while Berkuk arrived to expel the remaining Mongol-Tatar armies. On the heels of the flight of Tamerlane in 1399, Berkuk died from causes unknown. Yet Timur did not flee. He had a prior city to conquer. Unknown to the military forces of Berkuk that were preparing to attack Tamerlane, Tamerlane returned back east to the city of Baghdad that he had earlier thrown out the Jalayirids rulers in 1393. He now returned and finished his task. Like Hulegu Khan thirty three years earlier, Tamerlane invaded the city of Baghdad on June 1401 CE and according to historians, 20,000 of its citizens were massacred. Timur had earlier ordered that every Mongolian warrior show his loyalty to him by bringing back to him at least two severed heads from the Baghdadi residents. According to Islamic legends, many of his warriors carried heads from prior campaigns in order to assure that there would be enough heads in Baghdad to present as trophies to the “Scourge of God.” The last of the Mongolian presence would soon leave the Middle East and the lands of the children of Isaac and Ishmael forever. Then in 1402 CE, Tamerlane captured the port city of Smyrna from the Christian Knights of Rhodes. Christian rescue ships were quickly dispatched from Constantinople that earlier came under siege from Tamerlane’s forces. In the decade before the Destruction of the Temple of Solomon, according to the Emeq HaMelekh, an ancient Tosefta of the Talmud describes the roles of five worthy men, Shimur Ha Levi, Haggai (Chaggai the Prophet), Zechariah son of Iddo, Zedekiah (Zidkiyah), Hezekiah (Hizkiyah), Hilkiyah, Ezra the Cohen, and Baruch son of Neriah the Scribe for Jeremiah. They were commissioned on a secret mission to hide the treasures of Solomon’s Temple. The mortality rate was over 50% of the 230 plus priests and other men noted as worthy who were entrusted in this clandestine mission to put the furnishings and vessels of the Lord into long term hiding. This Mishnah had breathtaking significance seeing the mortality ratio of the Jews that hid these precious artifacts in that they were hidden in a tower in the land of Babylon in the ancient city of Bagdat (Baghdad). The documentation of this hunt for these treasures continues to this day by the rabbanim and has significant subterranean impact in the War against Saddam Hussein in the Nation of Iraq. Within this cache of treasures, we have a description of the gold and silver bread molds, which give us visual insight into the awesome perfection and specificity of how the Lord of hosts wanted his services to be performed. We will go through a study on bread molds and bread baking ovens in the ancient world of the Egyptians, Syrians, and the Hebrews. The Hebrew Showbread or the Bread of Presence was special to the Hebrew temple service in which the Family of Garmu of the Kohathites became the nationally recognized specialists in Showbread baking. Weekly the fresh showbread was placed on the Table of Showbread along with Frankincense to be used on the Altar of Incense. What was even more spectacular was that the gold and silver bread molds were encrusted with Margaliot pearls and precious gemstones. The Menorah was the only source of lighting in the Sanctuary and the Temple. It represented the Glory of God, the seven pipes the eyes of Jehovah, the presence of the Holy Spirit in the lamp oil and a portrayal of the coming anointed one called the Maschiach. The preparation for the coming of the anointed one, the messiah (Maschiach) was in the rededication of the Temple of Zerubbabel by the Maccabees, when the golden menorah was abducted at the desecration of the temple during the Abomination of Desolation by Antiochus Epiphanes IV. At this time the festival of Chanukah was instituted, the eight lamped Hanukkah menorah was first made and the Festival of Lights started the Essenes in preparation for the coming of the Maschiach. Wilderness Sanctuary of Moses (Moshe) was were clustered facing the Ner-ha-Ma-arabi (Ner Elohim), the Western Lamp. It was this lamp that quit burning in the Temple during the time of the high priest of Simeon Tzaddik, the Righteous, when the crimson cord failed to turn red, and the great temple door, called the Hekel refused to close as omens to the Jewish people during the forty years before the fall of Jerusalem in 68-70 CE. We can today trace the route of one of Herod’s Temple menorahs that was captured by the Roman forces for the portrayal of that event was engraved on the triumphal Arc of Titus. The modern investigation and request by the National of Israel to the Holy See to return the menorah and other temple artifacts from the archives of the Vatican will be documented. Of the Levites, 130 were killed and 100 escaped with Shimur HaLevi and his companions. These [men] concealed 500,000 trays of fine gold, and 1,200,000 of silver; 500,000 bread molds of fine gold, and 1,200,000 of silver. On each of the molds, there were 5 Margaliot (pearls?) and 2 precious gem stones. The value of each precious stone was 100 talents of gold, and the total value of all the Margaliot was 200,000 talents of gold. There were also 36 golden Trumpets. All of these were hidden and concealed in a tower in the land of Babylon, in the great city called Bagdat. [There was also a 7-branched] Menorah of fine gold, [worth] 100,000 [talents], with 7 lamps on each [branch], 26 precious gem stones on each Menorah, each Margalit (pearl? gem?) priceless, and between every gem stone, 200 [smaller] stones, also priceless. *Numbers may be off by a factor of 103 due to translation so 100,000 may actually be 1,000. The incredible numbers in the Mishnayots - As a Bible Searcher, we have always had a tremendous respect for the authors who wrote in the ancient times. If they stated a historical fact, then we are inclined to believe the facts as stated. The facts of the Emeq HaMelekh are not hard to fathom if you have a good understanding of all the myths and legends of the fabulous wealth of King Solomon. Standing at the crossroads of the world when there was a vacuum in political power from the east to the western worlds, suggests that the wealth of the nations could have flowed to Jerusalem. This was a spiritual revolutionary force at work... Dedicated, brave and stealthily these Judahites did their assigned mission. Mission Impossible? No, but the mortality was high. One hundred thirty of at least two hundred thirty five trained commandos gave up their lives for the preservation of the future and end time resurrection of the Mishkhan or Sanctuary of the Lord. BibleSearchers Reflections – “One of the great Israeli experts on the lost Temple treasures is Rav Menachem Borstein. Moshe Notzar published an article in the Yibane HaMikdash 108, which had been originally published as: “Yom HaShishi” 8 AV 5763 and later republished in the Temple Mount Recent Development in the News about October, 1996. Through the years Rav Borstein maintained secret yet extensive contacts throughout the Middle East. About 1985, he was in correspondence with the director of the National Museum in Baghdad, where according to Rav Borstein’s investigation in the Cabalistic literature that some of the vessels of the First Temple were still hidden in Baghdad. Copy of the Copper Scroll found in Cave IV near the Essene settlement at Qumran. The Aramaic test tells of a hidden treasure of silver and gold weighing about 120-160 tons and lists over 60 hiding place, most nearby to Jerusalem and Jericho. It has now been 12 years after the 2003 Iraq Invasion that toppled Saddam Hussein’s power in Iraq. The angel of Iraq had now been toppled and the reincarnation of Nebuchadnezzar was hanged by Shi’ite warriors. Here then lies one of the revolutionary secrets of the ages. Saddam Hussein, the modern Nebuchadnezzar of Babylon, and the modern government in Iraq that are under the threat of the Islamic State (IS) were potentially sitting on top of some of the greatest archeological treasures of the Temple of Solomon. Within this museum are objects that would obviously be a national treasure to the Nation of Israel and could cause a major geo-political shift in Moslem-Israeli relationship if they were revealed to the world public. During and after the Gulf War of 2003, somewhere between 3,000 and 7,000 archeological relics were believed to be still missing from the Baghdad Museum. Over 700 had been returned. At least 40-50 of them were considered to be of great historical significance according to Laurent Levi-Strauss, chief of the section of museums and cultural objects at U.N. cultural body called UNESCO. Not only that they were the secured depository for innumerable Torah scroll that were recovered in the Baghdad Museum that was flooded and other scrolls hundreds of years old that were the once vast depository of Jewish Torah history awaiting to be saved from destruction and mutilation. Could the War on Terror that challenged Hussein’s right to inflict indiscriminate evil against the people chosen by God and the land of Israel by the Lord of hosts may now be opening the way for the fulfillment of the restoration of some of the temple artifacts that belong in the Temple of the Lord. It was thought that possibly Iraq will once again come against under the influence of the western powers and be open to the investigative shovel of the archeologist. Over the years, Sunnis have grown doubtful that they have a fair stake in an Iraq run by the Shi'ites-first sectarianism of Nuri al-Maliki. In the last few months, some 14 Sunni groups that were once loyal to secular state of Saddam Hussein have now made alliances with ISIS, the Islamic State in Iraq and Syria. Even so, over the past eight months the geo-political events in Iraq have escalated so rapidly that the beleaguered Iraqi Shi’te forces under Iraq’s Prime Minister Nouri al-Maliki have failed to reinvent themselves into the new political religious uprising while ISIS was paving a wide swathe of land that would be theirs as they first gained control over Baiji, Mosul’s main Iraqi oil refinery south of Mosul towards Baghdad. After Mosul was secured, clear across the country, the ISIS militants penetrated through the main Iraqi-Jordan border that sent ripples not only through Ammon, Jordan, but also cascaded over to Riyadh in Saudi Arabia, but effectively put hundreds of miles under ISIS control as they continued to encircle the capital at Baghdad on this winning streak until the “killer instinct” of the jihadist warriors close in upon the central region of the capital. If we only had a prophet like Elisha, who could open our spiritual eyes as he did for his servant, Benhazi, so that we could see that we are not alone and that the armies of the Divine are here protect His chosen ones. Oh, that the gates of heaven would be opened for heavenly forces are also involved in the “war games” to fend off the dark forces of HaSatan seeking to gain control of our universe. While the armies of the Islamic jihadists are there in Iraq seeking total control over Saddam Hussein’s former land, nearby, according to the Emeq HaMelekh, within the land of Babylon, concealed in a tower in Opis the site of the ancient city of Baghdad appears to be treasures of immense value whose religious heritage may shatter the power of the evil perpetuated by the children of Ishmael. Some of these treasures appear to have been recovered and were a part of the Iraqi cultural displays in the Iraqi National Museum that is now under threat of again being looted and destroyed like it was in 2003; this time by the Sunni forces of ISIS. The site some scholars presume to be the ancient city of Baghdad is the ancient city of Opis on the eastern bank of the Tigris River. This city was called Upî or Upija in Akkadian was first known in ancient geography about the time of David and Solomon in Jerusalem. It was the site of an ancient “royal canal” between the Tigris and the Euphrates and also at the end of a long wall built as a protective shield against the Median invaders by Nebuchadnezzar. According to Livius, the city of Opis was connected along the commercial roadway between Susa in Elam and also situated on the so-called Royal road, which connected central Assyria with the Elam capital of Susa then on to Sardis the capital of Lydia. 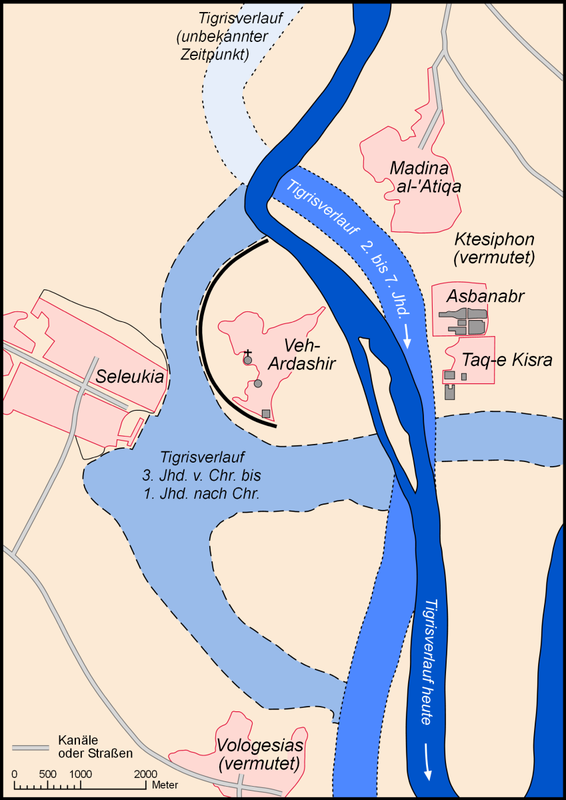 The precise location of Opis has not been established, but from the Akkadian and Greek texts, it is clear that it was situated on the east bank of the river Tigris, not far from the confluence of Tigris and Diyala. A possible candidate is a place called Tulûl al-Mugaili. Opis is mentioned for the first time at the beginning of second millennium BCE. In the fourteenth century, it became the capital of an administrative region in Babylonia. At an unknown moment, the Babylonians dug the "royal canal" between the Euphrates and the Tigris, which ended near Opis. The Babylonian king Nebuchadnezzar built a wall between the two rivers to protect his country from a Median invasion. This wall also ended near Opis. Opis was also situated on the Royal road, which connected Elam's capital Susa to the Assyrian heartland and - later - the Lydian capital Sardes. At the end of the fourth century, king Seleucus I Nicator, the successor of Alexander, built Seleucia on the opposite bank of Opis. From now on, Opis was a mere suburb. The Roman historian Tacitus informs us that in the first century, Greek and native inhabitants were still recognizable and had institutions of their own. The Parthians, who had taken over the country in the second century BCE, known as the Scythians who were the military wing of the Lost Ten Tribes of the House of Israel became the strongest opponents of Rome. They kept the Roman Empire away from the region of the Tigris and the Euphrates. Not only that they fought alongside the last of the Maccabee rulers against the Roman-Herodian forces that eventually conquered Queen Alexandra II, the last ruler of the Maccabees, and kept her imprisoned in King Herod’s Palace the rest of her life. As a Scythian, Arsaces I was a Lost Israelite king, who was part of the “Great Wanderers” of the Lost Ten Tribes of the House of Israel, as Syncellus identified “were allegedly descendants of the Persian Artaxerxes IIAchaemenid king”. So, Arsaces I became the founder of the Arsacid Parthian Empire that was the bridge to the last and final ancient Iranian Persian Empires called the Second Sassanid Persian Empire. The capital of the Arsacid Parthian Empire, Ctesiphon became one of the largest and most power cities of the ancient world starting in the 1st century BCE. Ctesiphon’s name alone is found in the Book of Ezra as the once unknown place called Kasfia or Casphia. The name was a derivative of the ethnic name of Cas, a cognate of Caspian and Qazvin. It was here the place that the Jewish Scribe Ezra sent back a plea to the Lost Ten Tribes of the Parthian Empire for help to send over “genetic blood-lined Cohens” to be trained for use in the newly build Temple of Zerubbabel in Jerusalem. It was near Baghdad that the Syrian general Seleucid, one of Alexander’s four generals who split up his empire after his death, decided to build his new capital, Seleucia. It soon became a major trading center in the Mesopotamian valley. Right after the Maccabean defeat of the Syrian ruler Antiochus Epiphanes IV, the city was destroyed and nearby on the other side of the Tigris, a new city which was growing, Ctesiphon, which became the center of trade with the Asiatic regions of the world. It is near Ctesiphon that modern Baghdad was erected by the Abbasid Caliph al Mansur in 763 CE, who called it the “Garden of Dat.” In the site of old Ctesiphon, the remains of the ancient city walls are still visible plus the remarkable palace with vaulted ceilings. So did Baghdad, or Bagdat, as the Emeq HaMelekh called it exist during the time of the Babylonian ruler of Nebuchadnezzar? By all indication from history and archeology, the answer is yes. Yet in the chaos of the 2003 Gulf War, the Museum was looted and pillaged, but out of the 170,000 artifacts in the museum, most were found to be safe. In the primary storage rooms, the security had been breached and about 15,000 archeological artifacts were gone. These included thousands of cylinder seals, plus iconic artifacts such as the Lady of Warka, a stone head of a woman discovered in Uruk, considered the oldest city in the world. Yet the wisdom of the museum staff and officials, 8,366 of the most important of the relics were hidden in a safe room only known to a select few of the museum officials. The inventory list of the Treasures of Solomon’s Temple that was inventoried in the Emeq HaMelekh had some of the most magnificent furnishings within it. A 7 branched, 49 lamped Menorah in fine gold with 182 precious gemstones (26 per each of the seven branches) surrounded by 36,400 jeweled stones (200 for each 182 gemstones) imbedded around the priceless gemstones. Can we imagine what a golden Menorah with 49 lamps would look like? It would be one of the most exquisite candelabras known throughout the history of man. Seven branches with seven lamps on each branch. All of them have golden pipes coming from one common oil reservoir. Now consider the beauty of a beautifully carved lamp stand in which each branch on the candle had twenty six gemstones, faceted and engraved embedded in the gold. Then embedded around each of the larger gemstones were 200 additional micro-gems of various array of color, yet all sparkling and dazzling in a light display as the intense light from the combined lumens of the 49 lamps bounced off the walls of the Holy Place in the Temple reflecting a golden sheen of “red gold” from the Parvaim district of India and then were reflected in a dazzling display of iridescent and sparkling beauty as the light refracted from the thousands of gemstones embedded in the walls of the Holy Place. 1,200,000 (1,200) silver bread molds, each embossed with 5 margaliots (margalit = Latvian mirgot, mirdzaloti "shine, shiny, sparkling, glitter" or pearls or pearly cabochons?) and 2 precious jewels. 500,000 (500) trays of gold. These golden trays were more than likely used to carry and stabilize the bread molds as they were placed on the tables of showbread. 1,200,000 (1,200) trays of silver. These silver trays were more than likely had the same utilitarian function as the golden trays. The weight in talents of gold or silver is not known for either of these temple vessels. Before we move on, let us take a breath of fresh air. The archeological discovery of this cache of valuable vessels, the trumpets and the golden menorah would rival the discovery of King Tut’s tomb in Egypt. Can we even comprehend the beauty of the dazzling 49 lamped menorah hidden in the ancient city of Baghdad, later the capital for the Scythian Lost Israelite warriors at Ctesiphon or Opis that is studded with gemstones whose worth is without measure? What about the thirty six golden trumpets? For professional musicians whose musical interest is in understanding the differences in the trumpets of the ancient world with modern day trumpets and cornets and the differences in the tonal quality between gold and silver trumpets would invaluable to the history and science of musicology. It would be fascinating to have an account of an internationally recognized trumpet player to describe the differences in the beautiful tones as played on a pure golden trumpet and a pure silver trumpet.